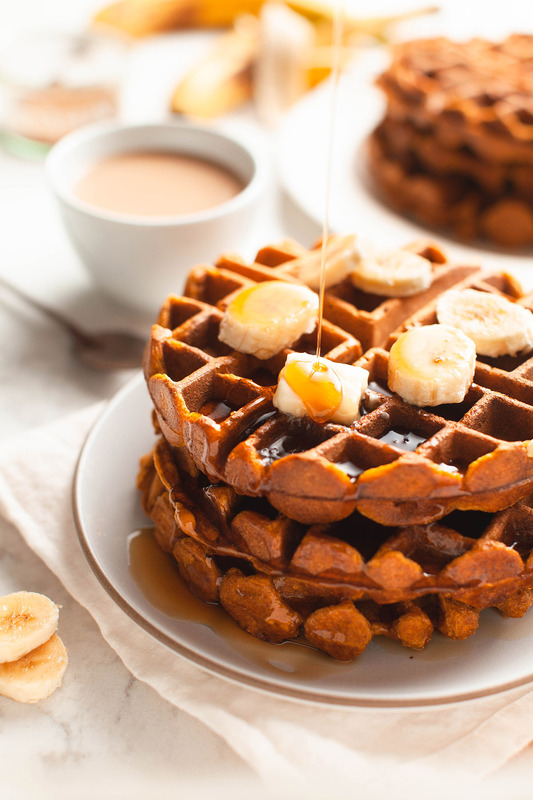 Bring fall to your weekend breakfast with these pumpkin waffles. Pair with other delicious fall breakfast items and some hot apple cider for the ultimate autumn meal. In a large bowl, combine all the dry ingredients (the flours, oats, baking powder, salt, cinnamon, all spice and nutmeg). Mix to combine all the ingredients. In a separate large bowl, combine all the wet ingredients and mix well. Pour the wet ingredients into the dry and mix until just combined. Preheat your waffle iron and when it is ready, grease it lightly with a little Colavita Olive Oil (pour about a tbsp into a paper towel and rub it into the waffle iron). Pour ½ cup of the batter into greased waffle iron and close the lid. Cook until the light on your waffle maker turns green (or indicates it is ready). Remove the waffle from the iron and repeat with the remaining batter. Serve with butter, extra sliced bananas and maple syrup.